Royal Palace at Caserta was begun during reign of Charles III. Arc-like wing on the left was rest center. Weary and muddy GI's climbed on trucks. They were going back to rest, to be away from the continual nightmare which had been plaguing them during the long winter months of the Italian campaign -- back to the town of Caserta, the "Versailles of Naples." 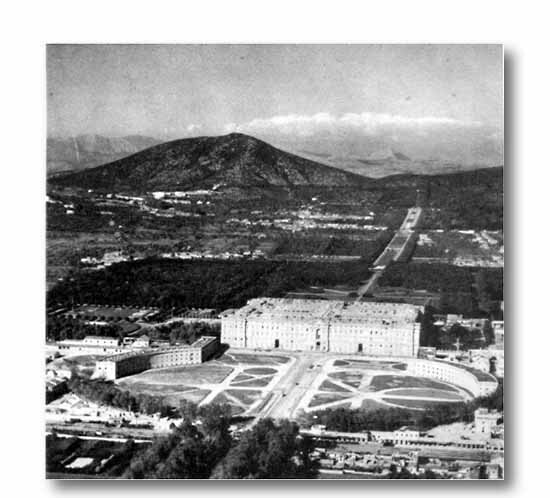 Situated seventeen miles northeast of the great Italian port, Caserta was best known for its Royal Palace which dated back to the year 1752. The Palace served as the hub of the Fifth Army rest center. The adjoining barracks, which lately housed Fascist airmen now provided quarters for the GI's. Operas were held in the Palace theatre, and other marble-columed rooms became servicemen's clubs. For five days the men lived in this haven. They slept as long as they wished, had hot showers and a clean set of clothes, ate hot meals three times a day, and were given the best entertainment available. PX rations were substantial. But what the men welcomed most was relief from the nervous tension synonymous with battle, the high-strung feeling that wears down morale. During most of the winter months, with Naples "off-limits" because of epidemics, Caserta gained its place as the leading rest center.